Happy New Year's Eve to everyone!! I hope everyone has some exciting plans tonight and everyone stays safe! We have spent every New Year's Eve since Ellie was born in the comfort of our own home. It's the one night of the entire year, that we really don't have a babysitter available to us, and actually, it's not really such a bad thing. Gone are the days of clubbing, ringing in the new year at fancy restaurants, and staying out till 2 a.m. Nowadays, we get into comfortable clothes, sometimes invite friends over to join us, and just hunker down at home to watch the count down on tv. We haven't ever kept Ellie up till midnight, and don't plan to this year. That little girl already has enough sleeping issues...I don't want to create another one by allowing her to stay up that late...even if it's a special occasion! I do plan to get back to more regular blog posts once the craziness of the holidays end. Until then, here's a super simple easy New Year's drink recipe for you! Enjoy! Fill the glass with a handful of cotton candy. 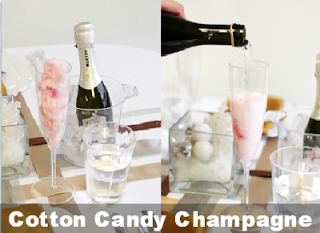 Pour champagne over the cotton candy. Serve immediately and enjoy! Have a safe and Happy New Year's Eve! Here's to 2013! It's so pretty! And I'll bet the cotton candy gives the champagne an extra-sweet kick. If I ever host a grown-up party again (haha), I'll have to try this! happy new year Kyna! hope it's a great one!! !